How to make a mask of paper or cardboard: carnival, New Year, Venetian? Holidays are loved by adults and children. Particularly interesting is the event, when the participants are dressed in thematic costumes, and their faces are hidden. The latter can easily be made independently from improvised materials. 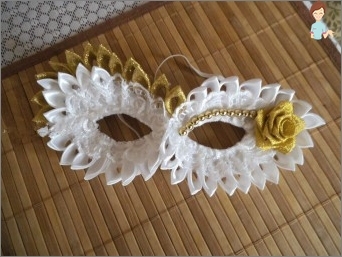 Below we will tell you how to make a mask of paper for a carnival show or New Year's party. With your own hands, you can make several types of such accessories, they will differ not only in appearance, but also in the way they are manufactured. Volumetric masks - completely repeat the lines of the face. Another kind of half-mask, which covers only the lower part of the face, and the eyes remain open. All these types of linings can be made at home from improvised materials. The manufacturing process is so interesting that it will not only entice children, but adults as well. How to make a carnival mask? How to make a carnival mask? The simplest thing is to draw a stencil on paper, in the form of a sign of infinity or the wings of a butterfly. Both sides of the picture should be proportional and have a slit for the eyes. Stencil is applied to the fabric or cardboard andCut out along the contour. Now we decorate with colors, decorate with sequins, beads and feathers. From the sides attach the tie or glue the stick, the type of lorgnette. The mask is ready! How to make a mask with your own hands in the form of a muzzle of animals or rim? To do this, all the above materials will be needed. On a thick paper or cardboard we draw a muzzle of a little animal. If the picture is made for the rim, it will beSmall, you can depict not only the muzzle of an animal, but also draw it completely. Then the workpiece is colored, cut and pasted to a paper or plastic hoop, which will be put on the head. The muzzle should completely cover the face ovalChild, it is also necessary to make slits for the eyes. It is fastened with ribbons tied to the sides. The ready template can be found on the Internet, printed and transferred to cardboard, painted with colors or pencils, cut and optionally decorated with feathers, beads, pieces of fur. If the child refuses to hide underYou can do without it. On the paper the oval is drawn according to the size of the baby's face, around it we finish the details of the image: the lion is mane, the bear has cheeks and chin, and the apple has a tail. We paint with the necessary paints, cut out the contour and the center. With the side stapler or with the help of glue we attach the elastic band - the accessory is ready! How to make a bulk mask? Flat masks are good for young children, more adult kids will want something more interesting. Offer them a large half-mask. How to make a mask of cardboard? A rectangle of heavy paper is applied to the face. On it we mark the place for the slits, bendAround the nose and on the bridge of the nose, we make holes for the tapes. We finish the outline and cut out. Now we need to decorate the half mask. Interesting coloring options can be searched on the Internet or include your imagination. You can also make papier-mâché. Such a mask will take more time, but it will fit perfectly to the face. First, the preparatory work is done. As a basis, you can take a hockey mask or make a cast of gypsum. Special bandages are soaked in warm water, onFace apply a thick layer of Vaseline. We put bandages, carefully pressing them on all the bumps and hollows. When it cools, carefully remove and leave until completely dry. How to make a mask with papier-mache own hands? The plaster cast inside is smeared with petroleum jelly, the newspaper is torn into small pieces, we breed a paste. The first layer will be the main one. Dipping paper in the glue, we begin to spread it on the plaster, carefully working out all the bends. The second layer is done on the glue, carefully expelling the air from under the paper. For the third layer, half-cardboard or covers from magazines are required. The adhesive layer should be thick. Again the paper, and then the tissue layer. Cotton cloth or bandages are cut into small pieces, they are glued with glue and applied to the template. You have to be very careful not to get wrinkles and bubbles, excess corners are cut with scissors. Then follows paper, cardboard and soaked white, thick paper. Dry the product on base, at room temperatureTemperature and not less than 3 days. After that, it is carefully pulled out of the plaster and proceed to coloring. Here's how to make a New Year's mask yourself from paper and cardboard. Depending on the event, the product can be simply painted with colors, glued with feathers and sequins, decorated with gold leaf. 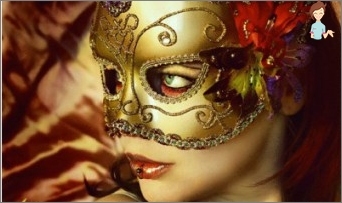 How to make Venetian masks? New Year costumes do not always meanThe presence of half-masks and caps, but will appear on the carnival in Venice without this attribute is impossible. This festive accessory has long conquered the whole world. Conditionally they can be divided into 2 varieties: classical from the Venetian comedy Del Arte and new characters that have appeared over the years of the carnival development. Such an accessory can be bought in a store or made independently. The base is made of papier-mâché or is made of plastic. For the first option, technologyMaking lining for New Year's costumes, it is only necessary to decide whether it will cover the whole face or only the upper part. Technology papier-mache is very accessible and easy, even a child can cope with it. 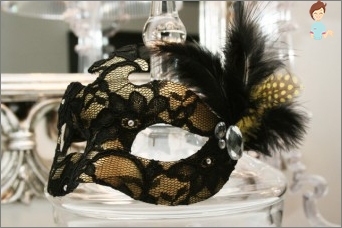 The Venetian mask of the New Year is distinguished only by the thoughtfulness of the images. The most popular are the persons of Harlequin, Pierrot, Zanni, Joker, Colombina, Venetian lady, Brigella and Doctor of Plague. For the decor you will need acrylic colors or gouache, gilding and silver, laces, sequins, beads and flowers. Only at first glance, making a template using the papier-mache technique seems long and time-consuming, but this process is very fascinating, so even the clock will fly by unnoticed. In the same way, you can make an accessory for Halloween. Having mastered the technology, you will know how to make a terrible mask yourself. To be of more use, bring to workChildren. This will not only help develop their motor skills, imagination and dexterity, you can spend more time together. With such an accessory on the matinee, your child will be the most beautiful and original, and then the craft can become a pretty decoration for the nursery.